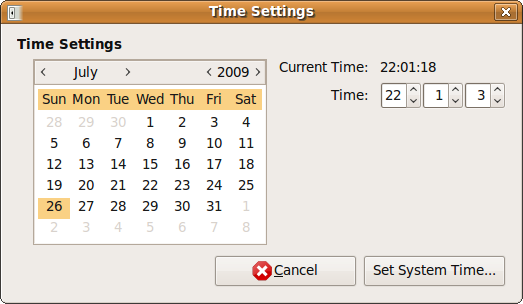 Question: How to change date and time on my Ubuntu or Kubuntu laptop ? Answer: You can change the date and time from the ‘Time and Date Settings window’ that can be launched using one of the following two methods. 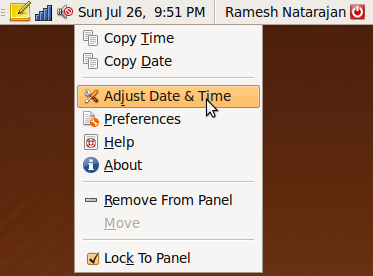 Right click on the date and time that is displayed on your system tray and select ‘Adjust Date & Time’ as shown below. After modifying the date and time from the following window, click on ‘Set System Time’, which will ask for root user password before saving the values. If you don’t have the date & time displayed in the system tray, Click on System -> Administration -> Time and Date. By default, this will show the date and time in the locked mode. Click on Unlock and then give the sudo user password. After unlocking you can change the date and time as shown below. Thanks for your feedback. I agree with you that this article is lame and boring. I’ll try to avoid such basic articles in the future. It wasnt boring and it was helpful. I am new to Ubuntu and Linux in general. It sure does help to dive in and check out this platform with helpful articles and hints – like this one – that make it easier for us newbs to enjoy the experience. Thanks alot. 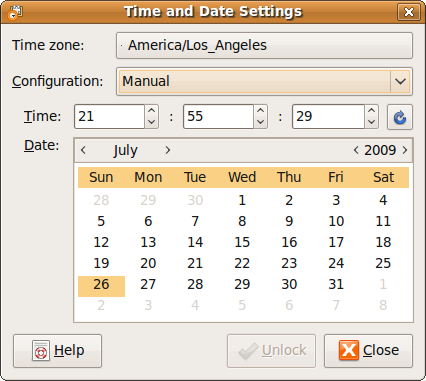 Problem with the lock function for time and date in Ubuntu is that every time I look for another date (when planning a trip for eg.) it asks me for my password. This is a real nuisance. Is it possible to get rid of this default setting or should I just download a normal calendar ? Next post: Did You Know The Geek Stuff is on Twitter?